In a blatant plug for the Reagent Guide, each Friday I profile a different reagent that is commonly encountered in Org 1/ Org 2. Version 1.2 just got released last week, with a host of corrections and a new page index. 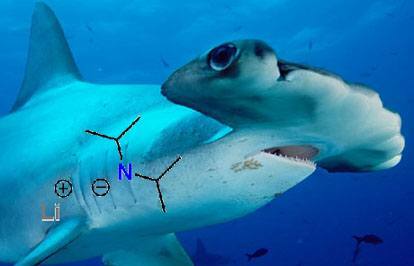 If NaNH2 is a piranha, then today’s reagent – lithium diisopropylamide (LDA) is like a hammerhead shark. It’s also got a powerful bite, but that distinctive proboscis can get in the way. So LDA can’t reach into tight spaces the same way that NaNH2 can. Also note the temperature (–78 °C). There’s nothing special about –78° relative to –72° or –60° for this to work – it’s just that cold temperatures improve the selectivity, and –78°C happens to be the temperature of a very cheaply prepared cold bath (dry ice and acetone). A common solvent for this is tetrahydrofuran (THF). Why is LDA useful? Well, enolates are extremely useful nucleophiles, able to participate in SN2 reactions with alkyl halides as well as the aldol reaction (among many other things). If we used NaNH2 to form an enolate like this, we’d likely get a mixture of two enolates, which would lead to a mixture of products. The selectivity of LDA in forming the less substituted enolate makes it extremely useful. This diagram below shows the reaction between LDA and the ketone. Note the bonds that are forming (N-H, C-C) and the bonds that are breaking (C–H, C–O). The enolate that is formed has a resonance isomer where the negative charge is on the carbon. This is, in some respects, the more “important” resonance form, as it is the carbon that tends to be a better nucleophile than oxygen in reactions of enolates. P.S. You can read about the chemistry of LDA and more than 80 other reagents in undergraduate organic chemistry in the “Organic Chemistry Reagent Guide”, available here as a downloadable PDF. Dr. Ashenhurst, you say “The most common use of LDA is in the formation of enolates. In the example below, notice how both carbons flanking the C=O have C-H bonds? LDA will remove the proton selectively from the carbon substituted with the fewest number of hydrogens” however it shows that the pi bond is with the alpha carbon and the beta carbon with more hydrogens. so LDA will remove the proton from the beta carbon with the most hydrogens, ie hoffman product. Oops – typo, fixed. Thanks for the spot. In resonance forms atoms do not move about. The picture you have of the Li cation being next to the methanide atom and then close to the oxide atom is actually a dynamic equilibrium. (The picture of a free enolate represents resonance.) This is an important distinction because, by Hard-Soft Acid-Base Theory the hard LI+ is more tightly bound to the hard O- leaving the methanide more available for attack while in KDA the the soft K+ binds preferentially to the soft methanide making the oxide more available for attack. 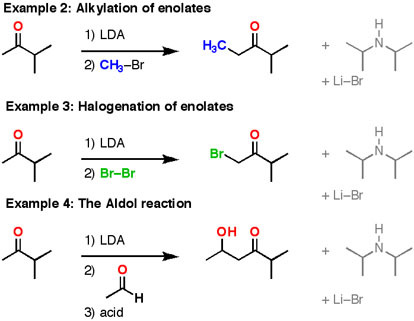 In example 4, the aldol reaction, wouldn’t be Li+ instead of LiBr? There’s no bromide anywhere in the reactant side. Sir, beautifully explained. I just have one doubt though. What will happen if end carbons of the isopropyl groups are attached toa strong -I group like NO2? Then will the H+ be abstracted by the LDA from the tertiary carbon atom of the isopropyl group? That reagent doesn’t make very much sense. why you given reagents name friday reagent.????? Because it was a fun way to talk about reagents, that’s all. Under what conditions is LDA nucleophilic? I have a book (science of synthesis, Houben-Weyl) that says it happens in the absence of a weakly acidic proton donor. For example, it can reduce an alkenylphosphenate by 1,2 addition across the double bond with lithium. But it doesn’t go into further detail, and I’m not sure what in particular a weakly acidic proton donor has to do with this reaction. Do you know anything about LDA functioning as a nucleophile? Thanks! So, basically LDA helps in anti markovnikov reaction mechanisms and hofmann eliminations right ? If that’s the case, then in example 2 shouldn’t the CH3 be on the 3 degree carbon (that’s anti markovnikov)? in LDA there is no CO NH bond, but why this is called amide in the name? They are both called, “amide”. I know it’s confusing. Amazingly explained, thanks! 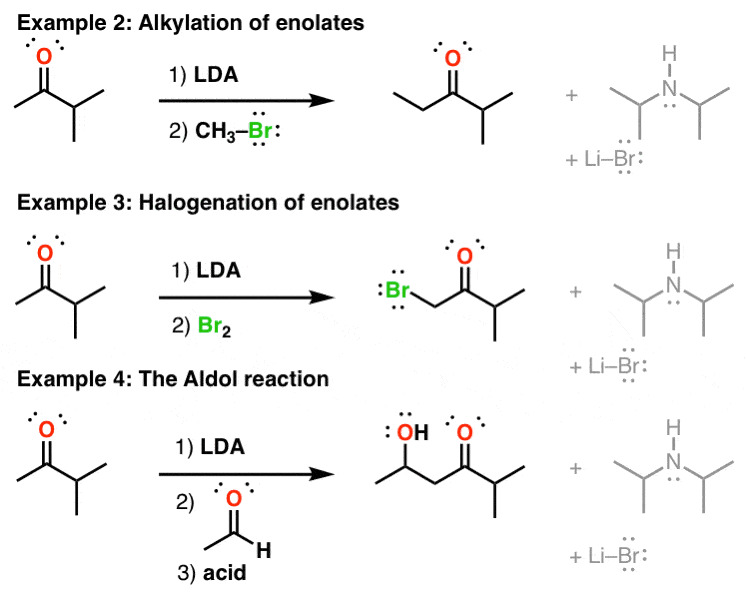 One question tho, how come neither LDA nor LCHIA work with aldehydes? They add to the aldehyde carbon instead of deprotonating the alpha carbon. TL;DR Your textbook is pretty much correct. “Cannot” is a pretty strong word, because there are always exceptions*, but on the whole it’s a good rule of thumb. More detail: It depends on the nature of the carbonyl. Alpha,beta unsaturated aldehydes, for instance, will almost always undergo 1,2 addition. With alpha beta unsaturated ketones, and especially alpha beta unsaturated esters, there is a lot of wiggle room. [1,4 addition to an ester is particularly favoured vs 12 addition, since you’re going from a ketone enolate to a (less stable) ester enolate.] The steric hindrance around the carbonyl and the beta position will also be important, as will the choice of solvent. Since you’re likely dealing with an advanced textbook, I’ll use the more advanced terminology “hard” and “soft”. A lithium enolate is a relatively “hard” nucleophile and is more likely to react at the “hard” carbonyl electrophilic site. Lithium ion coordination would help with this, as would solvents that facilitate aggregation (e.g. ethereal solvents like THF and Et2O). It’s possible to favor 1,4 addition by using a base with a larger, less-coordinating counterion (such as potassium instead of lithium) and using a polar aprotic “co-solvent” such as HMPA which will break up aggregation. These reactions tend to go through open transition states rather than through the Zimmerman-Traxler six-membered transition state that you mentioned. *Exceptions? Sure. Like if you formed a lithium enolate in a molecule which also contained an alpha beta unsaturated ketone, and 1,4-addition would form a 5 or 6 membered ring. Much faster than 1,2 addition in that case, due to ring closure rates. Another example would be sterically hindered ketones. Digging through my copy of March (5th ed) chapter 15 on addition to C-C multiple bonds doesn’t mention a specific prohibition of lithium enolates in 1,4 addition, but it’s not uncommon to see people use a Mukaiyama-Michael or a Sakurai reaction (using a Lewis acid in the presence of a silyl enol ether) to perform a 1,4 addition instead of the lithium enolate, likely for the reasons you mentioned. Does NaNH2 also give Hoffmann product like LDA in dehydrohalogenation? No, since NaNH2 is small, I would expect it to give the Zaitsev product. Though there is no amide group then why LDA is named as lithium Di isopropyl amide? Confusingly, the term “amide” refers both to a deprotonated amine, and also a carbonyl derivative with a nitrogen substituent. do you know in what cases we’d use n-BuLi over LDA? Because chemists use the word “amide” to describe two completely different functional groups: the conjugate bases of amines (e.g. sodium amide) and also carboxylic acid derivatives with nitrogens adjacent to the carbonyl. That’s just the way it is. 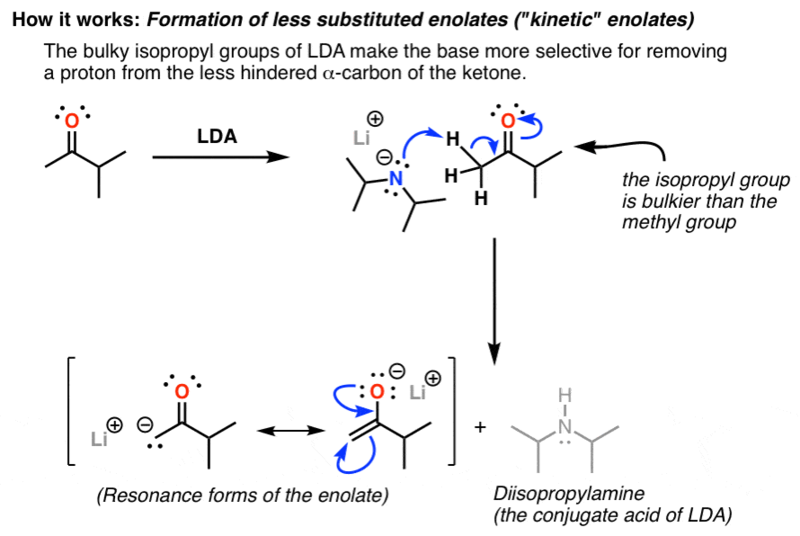 What does LDA do if you have equal substitution at either side of the ketone? Is it possible to can count carbons to determine least substituted (if we had methyl vs, ethyl, not isopropyl, for example in #2). In this case will addition occur on the side of the methyl? Not sure about methyl vs ethyl, but methyl vs. primary alkyl gives about 80:20 favoring the methyl.